Alfa Laval Aqua Blue S-type. 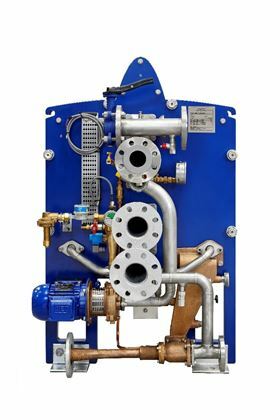 But Alfa Laval’s Aqua Blue S-type maximizes energy efficiency and capacity-to-footprint ratio by making use of the vessel’s existing seawater cooling system pumps. This could cut electrical power needs by 70% compared to conventional freshwater generators, and it shrinks the Aqua Blue footprint by up to 15%. Besides its smaller footprint, the Aqua Blue S-type offers shipyards new flexibility, including a range of connection alternatives. Because it makes use of the vessel’s seawater cooling system pumps, it employs a smaller ejector and a smaller, separately installed ejector pump. Likewise, the pipework can be both shorter and smaller in diameter. The S-type handles a wider span of pressures, which means the configuration can be adapted to the highest or lowest water level. An adapted configuration is able to deal with higher pressure in the overboard line, which allows the freshwater generator to be placed more freely on board.